Salivary gland - Fibrosis in a male F344/N rat from a subchronic study. Fibrillar eosinophilic material (fibrosis) surrounds the salivary gland and separates the lobules. Salivary gland - Fibrosis in a male F344/N rat from a subchronic study (higher magnification of Figure 1). There are inflammatory cells within the fibrotic tissue. Fibrosis can be found in and around the salivary glands ( Figure 1 and Figure 2 ) and often replaces glandular tissue. It may be seen concurrently with severe inflammation and necrosis. 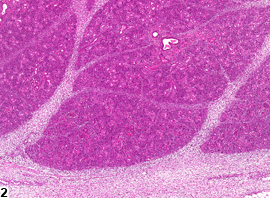 In some chronic cases, the inflammation and necrosis have resolved and the fibrosis appears as largely acellular, eosinophilic tissue. In such cases, the affected gland or lobule may be small, and there may be atrophy of the glandular acini. Whenever present as the sole lesion, fibrosis should be diagnosed and graded. However, unless it is the end stage of a lesion, fibrosis is rarely seen without concurrent tissue damage or inflammation. 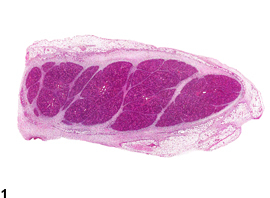 Whenever it is a significant component of a degenerative, necrotic, or inflammatory lesion, fibrosis should be diagnosed and graded. Atrophy of glandular tissue that is considered secondary to fibrosis should not be diagnosed separately unless it is a prominent component of the lesion. Secondary lesions should be described in the pathology narrative. Ackermann MR. 2007. Chronic inflammation and wound healing. In: Pathologic Basis of Veterinary Disease, 4th ed (McGavin MD, Zachary JF, eds). Mosby, St Louis, MO, 153-191.